Molly is the Director of Marketing and New Business Development for rAVe [Publications]. You can contact her at molly@ravepubs.com. Black Friday & the AV Industry: Does it Help, Hurt, or Hardly Matter? Does Working in AV “Ruin” Events For You? In my last episode of the blogging mini-series, I talk about how to promote your company blog! rAVe SMB Tip of the Week: What Kind of Content Should I Blog? This week’s social media tip of the week is all about what kind of content you should blog! rAVe SMB Tip of the Week on Blogging: How Often Should I Blog? This infographic was created by and has been re-printed with permission from Hatchbuck and mediabistro. The epic showdown between e-mail and social media marketing. Which deserves your marketing dollars? INFOGRAPHIC: What Trade Associations Are YOU a Part Of? There are so many trade associations providing different services and different value for the industry. We wanted to know how our readers felt about them, which ones they were a part of, etc. Here’s what we learned! Here is the latest research and analysis of the global projector market in Q2 of 2013. Data provided by Futuresource Consulting. Infographics are proudly sponsored by Spinetix. Working in the AV industry, we are all so inundated with technology day in and day out. But, we wanted to know how the AV industry uses their TV and cable at HOME. This is what we learned. 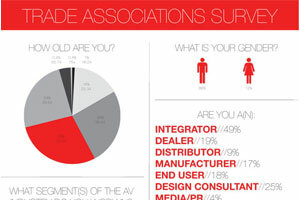 SURVEY: What AV Trade Associations Do You Belong To? The June 2013 projector market report infographic. Brought to you by Spinetix. The Cable Diaries: The Day Five C.C. The Cable Diaries: The Time Is NOW! Bye, bye cable! This week’s rAVe SMB tip of the week is all about Twitter misuse… things like retweeting, favoriting, etc.! Your questions answered! The Projector Market Report for May 2013. AV People: Ed Matthews of Visix, Inc. The Cable Diaries: Watch ESPN and HBO Go Added to the Apple TV! Game Changer?